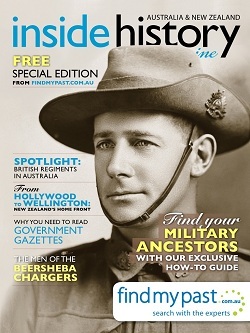 Findmypast.com.au and Inside History Magazine are delighted to announce a collaboration to produce an exclusive free digital magazine. The limited edition free digital magazine is available on iPad and online, making it a really interactive and entertaining way to learn more about family history. The digital magazine will provide intriguing articles by military experts to inform and entertain you. It will also showcase new international historical records available on findmypast.com.au. You will also be able to read captivating case studies about those connected with the war. Enjoy the stunning layout of this lovely magazine on your iPad or online today. Click here to download your interactive magazine for iPad. Click here to read the digital magazine online.